This book bridges the gap between practitioners of supply-chain management and pharmaceutical industry experts. It aims to help both these groups understand the different worlds they live in and how to jointly contribute to meaningful improvements in supply-chains within the globally important pharmaceutical sector. Scientific and technical staff must work closely with supply-chain practitioners and other relevant parties to help secure responsive, cost effective and risk mitigated supply chains to compete on a world stage. This should not wait until a drug has been registered, but should start as early as possible in the development process and before registration or clinical trials. 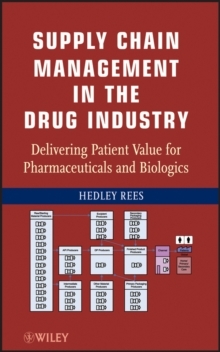 The author suggests that CMC (chemistry manufacturing controls) drug development must reset the line of sight from supply of drug to the clinic and gaining a registration, to the building of a patient value stream. Capable processes and suppliers, streamlined logistics, flexible plant and equipment, shorter cycle times, effective flow of information and reduced waste. All these factors can and should be addressed at the CMC development stage.